What is the Security Accounts Manager (SAM)? The Security Accounts Manager (SAM) is a registry file in Windows NT and later versions until the most recent Windows 8. It stores users’ passwords in a hashed format (in LM hash and NTLM hash). Since a hash function is one-way, this provides some measure of security for the storage of the passwords. The SAM registry file is located on your system at C:\WINDOWS\system32\config, but it is locked and cannot be moved or copied while Windows is running. The main function of the Security Accounts Manager is holding onto the passwords used to log into Windows accounts. When you try to log in to a user account, Windows will use a series of hash algorithms to calculate a hash for the password you just typed in. If the hash is equal to the password hash inside the SAM registry file, Windows will allow you to log in. Otherwise you’ll get the error message that user name or password is incorrect. The SAM registry file is not accessible while the operating system is booted up, this is why most of Windows password cracking software comes as an bootable ISO image. You need to boot up with another operating system like DOS, Linux or Ubuntu. When you copied the SAM file to external media, you can crack the passwords stored in the SAM file with a program like LC5 or Ophcrack. But it usually takes a very long time to crack a password, especially if your password is long and complicated. If you don’t want to go through the trouble of recovering the original password, then you can instantly remove / delete your forgotten Windows password using a boot CD like Reset Windows Password utility, which works with pretty much every edition of Windows out there, including XP, Vista, 7, and Windows 8. To use it, boot your PC using the program on a CD or on a USB thumb drive. Just follow the simple instructions on the screen to reset Windows admin/user password, and then reboot and log in. Recently I’ve got a really annoying problem at work. Some of my PDF documents can not be copied, edited or printed. I know that’s because they’re secured but how can I remove the password? Any idea to work out the problem? Sometimes we have or receive PDF files which are protected by passwords. We can’t print, copy or edit the content of an encrypted PDF document. This could be the case even when you have the legal right to modify the document but you’ve forgotten what your PDF password was. In this tutorial we’ll show you a quick way to remove the password from PDF documents, while still keeping the contents of the document intact. How to Remove Password from PDF Documents Quickly? 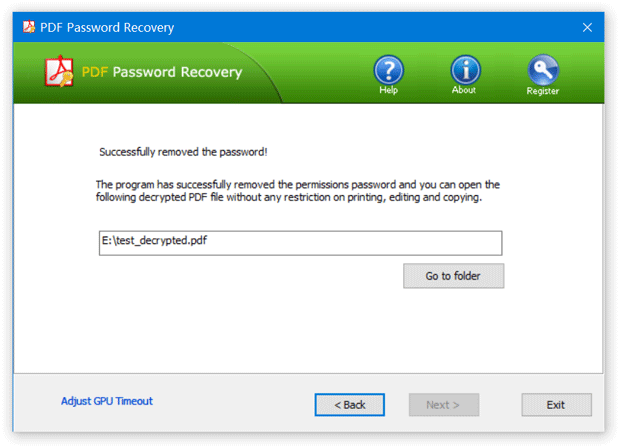 Download the setup package of PDF Password Recovery program. After the download is complete, double-click on the download file to install it on your computer. 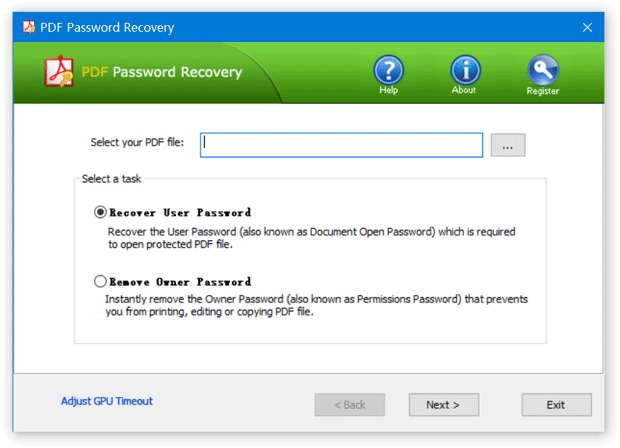 Launch PDF Password Recovery application. Click on the “…” button to locate your PDF document which is protected from printing, copying and editing. Next, choose the “Remove Owner Password” option. Click Next to remove the PDF permissions password. Just after a few seconds, the software will create a new copy of your original PDF file, while removing the password from the PDF document. Now you can open the new copy of the decrypted PDF document and use it without any copying, printing or editing restrictions. I have a Dell Inspiron n5010 with a Windows 7 Home Premium os. I have gotten myself locked out of it and the hint I put makes no sense. I have also tried the program Ophcrack but it failed to recover the password. Is there any way out to reset or clear the password on my Windows 7 Dell laptop? Forgot your password on a Dell laptop with Windows 7? Can’t log into Windows 7 after losing the password for the only administrator account on your Dell computer? It’s a nightmare, but there are several ways to get back in. We’re going to show you the easiest method to reset lost Windows 7 password on any Dell laptop computers. It’s straightforward and create a password reset Live CD or USB drive, which contains a WinPE operating system and tools you need to unlock your Dell laptop password. How to Reset Lost Password to Windows 7 Dell Laptop? Step #1: First, downloaded the Zip archive of Reset Windows Password utility on to an alternative PC with internet access. Right-click on the download file and then choose “Extract All” from the context menu. After extracting, you’ll find the ResetWindowsPwd.iso file. Just burn it to a CD or USB flash drive with ISO2Disc or BurnCDCC program. Step #2: After the Live CD/USB drive is created, insert it into your locked Dell laptop. Turn on or restart the laptop and press F12 when the Dell logo is on screen to access the Boot Menu. Choose the CD/DVD-ROM drive or Removable Device from the bootable device list and press Enter. 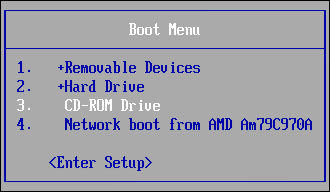 If you’re unable to access the Boot Menu, you can also press F2 to get into BIOS and then change the boot order. 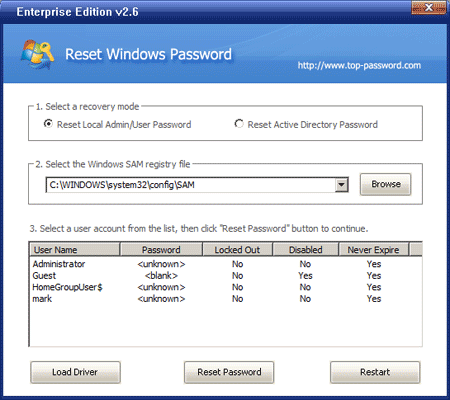 Step #3: After booting from the Live CD/USB drive, you’ll see the Reset Windows Password program and it shows you a list of local user accounts for your Windows 7 installation. Step #4: Choose the user account that you need to reset the password for and then click on “Reset Password” button. It will unlock and reset your lost Windows 7 password in no time. Remove the CD/USB drive and reboot the system. You can then log back into your Windows 7 Dell laptop without a password. So that is how can you reset lost password of a Windows 7 Dell laptop. It’s just a breeze to unlock Dell administrator password, even if you’re completely locked out of your laptop. If you need to reset forgotten Windows 8 password on Dell computers, please refer to this article: Forgot Admin Password for Your Dell PC with Windows 8 Pre-installed in UEFI Boot Mode. Forgot your Outlook 2013 password? It has happened to most of us many times. We set up a email account in Outlook 2013 and check the “Remember password” option, so there is no need to type the password every time we check our email using Outlook 2013. This is really convenient but it also gets us to easily forget the password after a long time. What to do if you forgot the Outlook password? 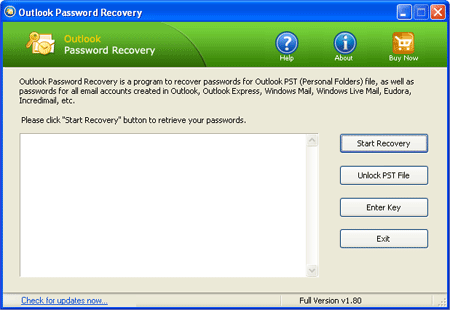 Using Outlook Password Recovery program you can recover Outlook 2013 saved passwords easily! This program extracts and decrypts the saved Microsoft Outlook (versions 97-2013) passwords from the Windows Registry for POP3/IMAP/SMTP/HTTP email accounts. Let’s see how it works. How to Recover Outlook 2013 Saved Passwords Easily? Simply download Outlook Password Recovery program and save it on your desktop, then double-click on the setup file to install it. Start the program. Next click on the “Start Recovery” button from the main interface of Outlook Password Recovery program. The program begins to search your Outlook profiles and instantly reveal your email account passwords along with other details such as server settings. 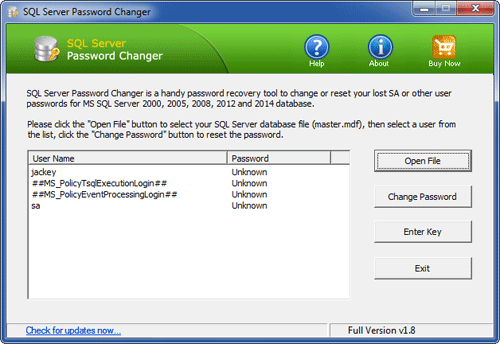 So this is how can you recover Outlook 2013 saved passwords easily. Outlook Password Recovery program also enables you to recover saved email account passwords from Outlook 2010/2007/2003/2000/97, as well as unlock .pst file password. I changed the administrator password and then when I tried to log in again, I forgot it. It’s an ASUS laptop and I do not have a password reset disc. How can I recover or reset the administrator password without wiping out the hard drive? Forgot the administrator on your ASUS laptop? Need to reset lost password in an ASUS notebook running Windows 7, Vista or XP? Losing an administrator password can render Windows system useless and the situation arises frequently. Luckily there is an easy way to unlock your ASUS laptop by resetting your forgotten administrator password, so you can log back in to Windows without reinstalling. How to Unlock ASUS Laptop if I Forgot the Administrator Password? To get started, download the .zip archive of Windows Password Reset utility which contains a bootable ISO image. Unpack the .zip file and you’ll get the ResetWindowsPwd.iso file. Burn it to a CD (or USB thumb drive) using ISO2Disc, BurnCDCC or other CD burning program. After the boot CD is created, take it out from the CD drive and then insert it into your locked ASUS laptop. Turn on or restart the laptop and press ESC when the Asus logo is on screen to access the Boot Menu. Choose the CD-ROM from the bootable device list and press Enter. The system will boot from the CD and open up the Reset Windows Password program after a while. The program automatically analyzes your Windows SAM registry hive and shows you a list of local user accounts. Choose the administrator account and click on “Reset Password” button, the program will reset the password and unlock the administrator account if it was disabled, locked out or expired. Remove the CD and restart your ASUS laptop. Now you should be able to log in to the administrator account without being asked for a password. Quickly unlock your ASUS laptop without losing any files on your computer. You can use this method to reset lost or forgotten administrator password on any ASUS laptop running Windows 8, 7, Vista or XP. How to recover Windows product key in the event your computer won’t boot? In one of my previous post I wrote how to recover Windows product key, but it requires that you are able to boot normally into Windows. What to do if your computer has already crashed? In this article we’ll show you two options to help you recover Windows product key from a dead or unbootable computer. Launch KeyFinder Plus and then click on “Start Recovery” button. Choose the “From non-booting system” option from the drop-down menu, a new dialog box will appear. Click the “…” button to specify the SOFTWARE registry file of your dead or unbootable hard drive, which is present in the Windows\System32\Config folder. Click OK. The program will now show you all the product keys that it is able to find from your broken computer which makes it very handy when needing to re-install. 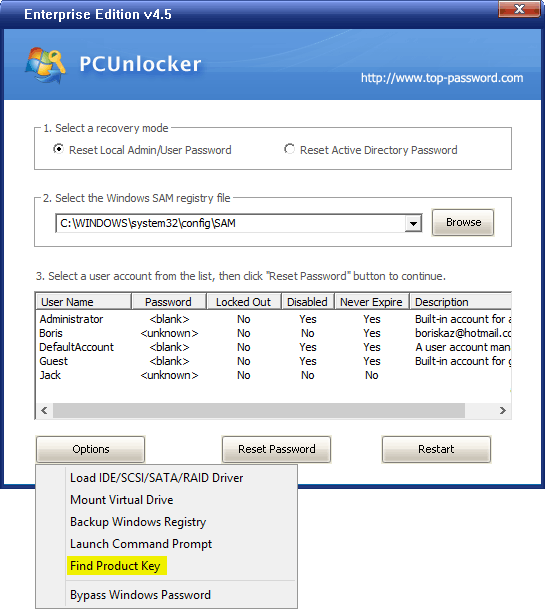 PCUnlocker is the ultimate rescue & recovery bootdisk which can not only be used to reset forgotten Windows admin/user password, but also recover lost Windows product key from crashed or dead computer. Boot your target computer from PCUnlocker Live CD, which can be created by following this tutorial. 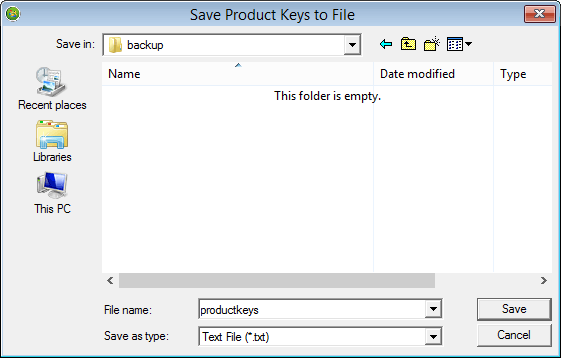 When the PCUnlocker program starts, click the Options button at the bottom left corner and then select “Find Product Key“. 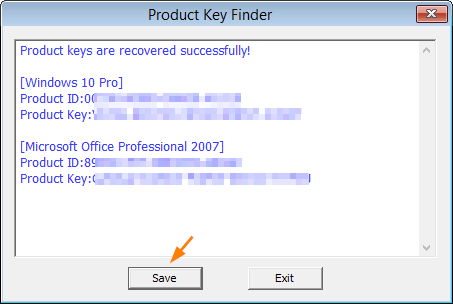 In the popup window, you’ll see a list of product keys which are recovered from your Windows installation. Click on Save. Browse to a location where you want to save the product keys. It could be your external USB flash drive. There are many other ways to recover lost Windows product keys from a dead or unbootable computer, but these two method above should be the best and the easiest ones. 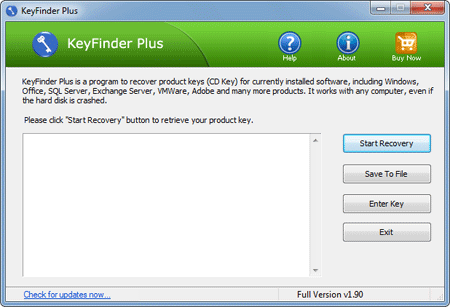 The key finder programs mentioned above support the product key recovery for Windows 10, 8, 7, Vista, XP, Microsoft Office and many other softwares.